I was trying to fulfill a promise of a hiking trip long overdue, so I was not thinking about the drive. I just wanted to get to Big Sur, a place that offers a bounty of hiking trails, as quickly as possible. 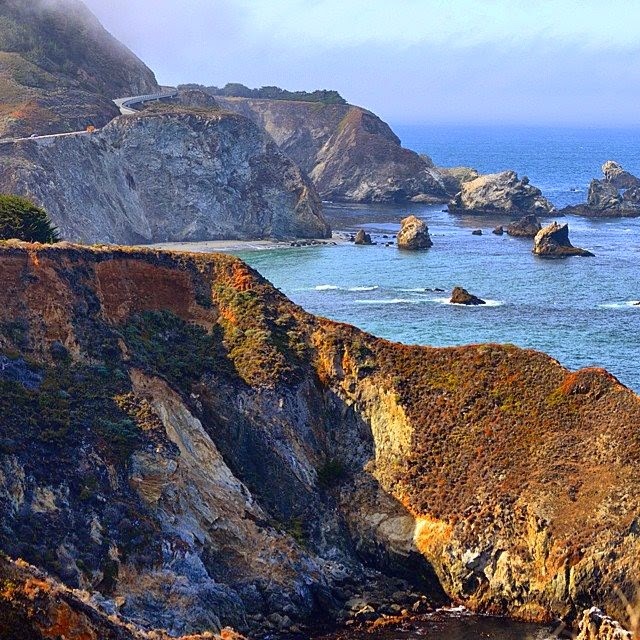 From Silicon Valley, I tried to avoid the winding Santa Cruz Mountains and decided to drive through US101 that connects to CA-156 to California Highway 1 to Monterey Peninsula. Little did I realize that the drive to Big Sur was to become a long and exciting drive, and one of the most memorable parts of our hiking trip. 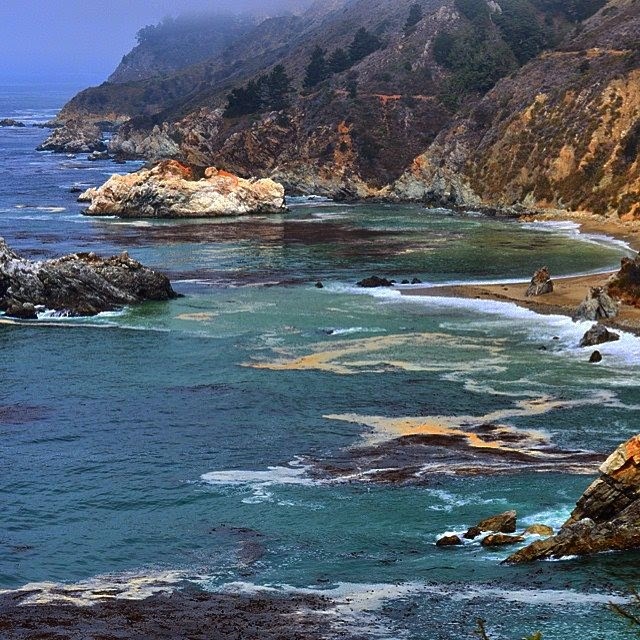 We drove up into the scenic California Highway 1 to Carmel in the dense fog. The fog was like a prelude to the drama to come. About half an hour from Carmel, a streak of sunlight passed through the fog. Occasional salmon-colored carvings (carved by nature) walled the highway, which followed the natural contours of the cliffs falling into the ocean. We rounded a corner and a mountain covered in fog towered above the cliffs that towered a stretch of sandy beaches and arch-shaped rocks. Then Bam! The fog parted to reveal a very dramatic view. The ruggedly beautiful coastline drew in my breath. We stopped and got out of the car at the lookout point to take pictures. Flanked by the mountains on one side and the rocky Pacific Ocean on the other side, Big Sur is about ninety miles of scenic grandeur. According to the California State Park map, CA-Highway 1 winds its length from Carmel to San Simeon. As we drove along, it was hard to ignore the breathtaking view of the blue ocean, which rode ruggedly to the distant horizon. We visited the McWay Falls, another famous attraction along Highway 1, before setting off to hike. To get to the McWay Falls, we parked inside the Julia Pfeiffer Burns State Park Parking Lot, crossed a footbridge and walked a short trail to the tunnel. As soon as we emerged from the tunnel, a stunning view of the ocean greeted us. We walked a hundred more steps to see a full view of the waterfalls. Sadly, the effect of the drought was obvious from the tiny water flow. But with the waterfall flowing into the ocean to meet the waves, the big rock in the middle of the ocean with a tree growing on it, the volcanic rocks surrounding the waterfalls, and the plants that included a sycamore tree made the whole site look dramatic. Farther down, we found informational posts about the imposing geography, and the natural grandeur of the meeting of land and sea, and the Pfeiffer-Burns family history, the first settlers in Big Sur. The trail ended at a viewing platform by the ruins of Julia Pfeiffer Burns’ house overlooking the rocky shore.